I'll be speaking at Cornell Plantations in Ithaca, NY on Wednesday night, covering the cultural stuff: Why America is not a gardening culture, why it should become one now. 1. Identify bulbs that will be most suitable for pot culture and purchase. Also purchase bulbs that are not at all suitable for forcing just for fun. Accumulate huge pile of bulbs in inconvenient spot. 2. Identify pots. Try to choose more lightweight pots, where possible. Buy pots on sale. Shake head over number of ugly pots you have accumulated over the years. 3. Evaluate soil situation. Is soil leftover from summer annuals in pots still Ok to use? If not, or if there is not enough, purchase large bags of potting mix. Avoid expensive mixes that contain fertilizer or are labeled “organic”; find cheap, lightweight mixes. 4. Option: place empty plastic pots upside down in containers to take up space and make them lighter. Some recommend packing peanuts at bottom of pot. 5. Fill empty pots a bit more than halfway; remove excess from pots that already have enough leftover soil. Find and discard old bulbs from last year and root masses from annuals. 6. Place bulbs—about 20-25 per container in circular patterns. Layer daffodils on top of tulips, if you want a mix. Try to alternate contrasting tulip colors; lose track and give up. 7. Cover top 1/3-1/2 of pot with soil. 10. Ignore for 5 months, occasionally wondering—when getting in and out of car—if they are completely frozen. They look frozen. They feel frozen. 11. Water them again in late March to wake them up. 12. Drag out the pots in early April. Water. Wait for bloom. Discover that the contrasting colors you chose really don’t complement each other as much as you thought. Realize that whatever you do, one type of tulip always blooms before the other type. Think about tulips you should have planted instead of these. But hey—they came up! Can We Double Our Eggplant and Basil Output? Last week, I went to hear a lecture considering how we can double agricultural output worldwide in the coming decades to keep up with population growth. Professor Wilhem Gruissem's answer was, in a nutshell, GMOs. "Agriculture is now a dominant force behind many environmental threats, including climate change, biodiversity loss and degradation of land and freshwater." "Agriculture is responsible for 30–35% of global greenhouse gas emissions, largely from tropical deforestation, methane emissions from livestock and rice cultivation, and nitrous oxide emissions from fertilized soils." Stop expanding agriculture. Cutting down tropical forests in particular has only limited benefits in terms of world food yield. (I've read that the soils there are relatively poor.) Instead, the paper's authors would like to see us reduce the loss of already productive farmland (fewer subdivisions?) and improve yields on the land we're already using. Close yield gaps. In other words, make underperforming land perform better. To do it without environmental devastation, the authors argue that it will take "reforming conventional agriculture and adopting lessons from organic systems and precision agriculture." Increase agricultural resource efficiency. In other words, improve nutrient and water use so some places are not squandering these resources while others are starving because of a lack them. In water-scarce places, they recommend mulching and reduced tillage, and God bless. Increase food delivery by shifting diets and reducing waste. Less meat--in particular, less grain-fed beef. Less waste--the authors cite an FAO study that found that about one-third of the food produced is never eaten, but lost to waste, spoilage, or pests. Turn that wasted patch of sunny suburban sod into a vegetable garden. You'll enjoy it. It will be pretty. The food will taste great. You'll take some pressure off the planet. Anyone else fed up with eco-evangelists? Heirlooms can provide a successful crop—and sometimes not. Happens every year. Regular as clockwork. The moment I mention heirloom tomatoes in my Toronto Star column, I get a nasty email from a woman I’ll call Martha. Martha doesn’t like my stand on these kinds of tomatoes. I tell my readers that they can be cranky (for a variety of reasons) and advise them to plant a modern hybrid too, so they’ll be assured of a good crop. Yet Martha objects. Strongly. This year, she called me “ a ridiculous joke” who knows nothing about gardening. I didn’t bother to reply to Martha (although I used to, because I love getting feedback about my columns and answer every email I get). I didn’t bother to tell her that I’m a master gardener, the author of six books on gardening and that I grow just about everything I write about, so I can give readers solid, practical advice. No, I ignored her email for the simple reason that Martha belongs to a tribe of zealots who increasingly make me see red. They are the eco-evangelists, the plant purists, the plant Nazis, the well-meaning but misguided people who insist that the only good plant has the tag “heirloom” attached to it. Whatever. I have another name for these folks. They are the new Puritans. Because hasn’t the environmental movement taken on all the trappings of a new world religion? To me, its dedicated adherents are exactly like the original Puritans— that is, a bunch of humorless, preachy, politically-correct purists who insist that their views are “the right ones”—and that anyone who dares to disagree with them on any topic is destined to fry in hell. For example: These new fundamentalists have dissed me for saying there’s nothing wrong with having a lawn. (Let’s face it, guys like lawns. And living in the country, with a whopping area to care for, I actually enjoy my lawn, too. It’s easier than flowerbeds and keeps bugs down, although I do point out that expecting pristine turf is unrealistic and using noxious chemicals to achieve that goal is definitely out.) And last year, I created an uproar in my column by saying that a few invasive plants—periwinkle, for instance—could be useful in places where absolutely nothing else would grow. One gent was so enraged by this suggestion, he tried to get me fired from the Star. And about those contentious heirloom tomatoes. Sure, I grow them. They’re delicious. I love their flavour. After much experimentation, my faves are Black Krim, Costoluto and Persimmon. (Get seeds from Renee's Garden because Calfornia-based Renee, bless her heart, sure knows her stuff and personally tests everything she sells.) Yet other kinds, I’ve found, can be cantankerous—prone to bacterial disease, cracking badly on top, their shoulders stay green, and they take far too long to mature in the chilly Zone 4 area where I live. So I always plant a modern hybrid too, to be on the safe side. But don’t tell Martha, will ya? I think she wants to kill me. Today is the last day of what has been a rather lengthy book tour. After three weeks on the road, I'll just be glad to wear something other than what's in my suitcase! Over the past few years, I have gone from throwing a few bulbs in pots—mainly the leftovers from in-ground and forcing—to filling at least 8 big pots with tulip pairings, to use in front of the house (the biggest and therefore least portable ones) and in the courtyard (size and weight not quite as important). I use the term “bulbs in pots” rather than bulb-forcing, because the pots stay in a cold garage and come out at the normal time for hybrid tulips to bloom (that’s May, here). They come up like clockwork, regardless of how cold it gets in the garage. I have tried hyacinths, but these turn to mush for some reason; this year, I may give daffodils a try. Right now there are 100 Prinses Irene; 100 Passionale; and 50 each of Black Hero, Orange Princess, and the embarrassingly-named Sensual Touch, ready to be packed into 8 (or so) pots. Whatever are left I can force, and those will be in smaller containers in the root cellar, to be used for house blooms in March. She got a letter from the Woodbine that used the usual key phrases like “first-time gardeners” and “young consumers,” assuring her that the campaign would be “… a massive, three-year, fully integrated effort that includes print and online advertising, PR, social and events.” I have not seen any evidence of the print part, but that’s not surprising since I don’t read any of the magazines that would be running it—the Woodbine blog mentions Real Simple, Parenting, and Shape as intended markets, and I have also heard it is in Better Homes and Gardens. I’m glad that there is pushback on this silliness, which is expensive and, if continued, would surely have the effect of pushing up bulb prices if nothing else. I'm still not sure if it would convince anyone to buy more, or start buying them. Is the GMO Fight Over? This week, I went to hear a science lecture at Skidmore College, "Can We Still Feed the World in 2050?" by Professor Wilhelm Gruissem of ETH in Zurich. As a serious vegetable gardener, I am, of course, monumentally interested in this question. The answer, according to Professors Gruissem is yes, with GMOs. He is most interested in genetic manipulations that boost the nutritional value of staple crops such as rice and cassava, as well as genes that fight pathogens that threaten crops like wheat and bananas--and not, thank God, in RoundUp readiness. He said that he differed from his colleagues in genetic engineering, also, in believing it would be good if we farmed more diverse crops, rather than just improve the handful of monocultures that provide most of the world's food. He also lamented the loss of diversity within different varieties of crops, and proposes turning the genetic variations in heirloom varieties of vegetables into information. He doesn't think seed banks like Svalbard are particularly useful to scientists--or farmers. "Farmers won't be growing these crops," he said. He thinks we need instead to create a giant database of the genetic riches in our vegetable varieties, so scientists can recreate and insert these old genes, should any of them prove valuable, into modern varieties. Of course, that puts the burden of evolution squarely on the scientists' shoulders. No more adaptation in a field! It's not easy, doing bioengineering in Europe, where GMOs are reviled. Professor Gruissem showed photos of activists destroying his field trials, his house spray-painted with anti-GMO slogans, and his wife's car covered in paint thinner. Professor Gruissem seems to have a great deal of contempt for the small farms that surround him in Switzerland--and the Swiss who think they need to see where their food grows. In America, we are more sensible, he said, because we believe food comes from the Safeway and we accept production agriculture. I won't take the time to go into the many ways that production agriculture is an ecological and nutritional disaster. Ultimately, the problem of feeding the world is one of limited arable land and a rising population. And diverse small farms, which can produce more food on the same acreage than giant industrial monocultures--with less ecological damage--seem to me an important part of the answer. Nonetheless, I do have an open mind about the possibilities of genetic engineering. But I would have assumed that this was a politically incorrect position. I seem to be wrong. The single most interesting thing about Professor Gruissem's lecture was that an audience of college students showed no outrage whatsoever in the Q&As about GMOs. In fact, they largely left it up to Professor Gruissem to criticize Monsanto. Has the battle for public opinion actually been won by Monsanto? Here’s another guest rant from James Roush, a professor of veterinary medicine who blogs at Garden Musings. Was anyone else seduced by the hype of the Drift® roses this year? The slogans were enticing: "From the introducers of the Knock Out family," and "The Next Big Thing for Small Gardens." Well, I might be alone out here on this limb, but even so, I'll be the first to say that I'm underwhelmed. Was I biased from the start? In the interest of full disclosure, maybe a little bit, since I know that while Conard Pyle had introduced the Knock Out roses to commerce, the creator of Knock Out, Bill Radler, is not the breeder of the Drift roses; they came from the lines of French hybridizers Meilland International. Fortunately or unfortunately it took me a week to start looking and by then the local nurseries had all sold out except for the pink and red varieties. And they were priced at $30.00 each! Given a price 50% higher than most potted hybrid teas, and taking into account that 'Red Drift' is more double-petaled than 'Pink Drift', I chose the red and only purchased one. I put it into a very large container in full sun and gave it more attention than any other plant this summer. And it is a good thing I only ended up with one, because I'm not impressed at all by my 'Red Drift' rose. You can see it above, pictured at the end of what was admittedly a very hot summer, the leaves a little scorched from all the Kansas sun. Yes, it seems to be blackspot resistant, but I did have to fight a bout of spider mites with pressurized sprays of water. It didn't grow 6 inches in any direction all summer long, despite almost daily watering in the extreme heat and careful attention to fertilization. And what you see above is the best bloom display I saw all summer, as pitiful as it is. The lack of bloom was a bit understandable during the heat spells, but I would think that the cooler weather of September would have kicked off a bloom cycle, wouldn't you? So, pending further evidence, I'm done with the Drift. They're just not enough of a landscape spectacle for me to overlook the fact that the blooms are not individually striking. I'm going to keep the container outside, so by next spring, I will have a strong test of how hardy mine really is. I also plan to see how these roses did in the garden of a friend who planted 50(!) of them this spring, so there's still a chance I'll change my mind. Or maybe not. If you get my drift. The book tour madness continues. There better be a very nice mojito waiting for me in Coral Gables, that's all I'm sayin'. Gardening on an island in a river in Northwestern New Jersey, Ken Druse is used to floods, which he stopped counting after the 12th. But Hurricane Irene was different. As Ken recently told the Annapolis Horticulture Society, Irene left his garden under water for FIVE DAYS. And deposited as much as TWO FEET OF SAND in some parts of his garden. Sorry for the all-caps but seeing his photos and videos of all the destruction left me traumatized! I asked Ken if he plans to restore his garden or was he considering moving on, and he answered, "I'm going to take it slowly. I have to make repairs to the infrastructure -- wall, bridge, deer fence, etc. Then I will continue to clean up. I suppose that does mean I will be trying to get a garden going, but I think it is an opportunity to figure out a new strategy." While some might think of destruction like this as an "opportunity" to buy lots of new plants, Ken knows that there's no way to replace plants you've nurtured for 15 years - without the huge budget required to buy full-grown plants. Readers, what would YOU do if you gardened here? He's "almost desperate" to get more people to grow plants and urged us to plant tree with kids, or just show them what's under a rock, but do it before they turn three or it may be too late. To help "Stop plant blindness", learn plant names! Boy, does he hate mulch volcanoes, dyed mulch, and the instant gardens on TV. But guess what! In stark contrast to the Michael Dirr, he actually LIKES the Beauty Bush (a favorite of mine) and recommends it and other large, old-fashioned, flowering shrubs, like Weigela and Mock Orange. He loves how effective they are at "shinking his property," which I agree is the fastest and cheapest way to create a lush but low-maintenance garden. Though he's authored 16 books, it's taken a whole lot of years to do that - an average of four years per book. So, he doesn't just pop 'em out. He's "really into oaks" because they provide more value to wildlife than any other plant. That’s what the National Trust for Historic Preservation will be getting in Buffalo this week when they roll in for their annual conference. That is, if the sight of thousands of red mums planted in selected Olmsted parks can be considered a luxurious welcome. I suspect most of these attendees will have their eyes trained on manmade wonders—about which I feel much more confident. There were a few funny comments about this on one of the local blogs, like “Let's just hope we don't get another Madonna incident where it turns out somebody ‘loathes red mums.’” Another reader thought that the city should “be focused on pleasing the residents first and foremost,” not just when visitors arrive. I wouldn’t say that I loathe red or any other color mums, but I do dislike these plants. The form and foliage of the common annual mums—such as those being planted in Buff—are stiff and unappealing. And let’s not forget their rather unpleasant scent. This is not totally about aesthetics, though. I love zinnias and dahlias, which have similar flower forms to the superior mum varieties and don’t smell much better. What bothers me most about these plants is that they suddenly appear for sale everywhere in early September and by November they’re done—not that you’d want to linger outside to enjoy them anyway. It’s hard to think of any other plant that has such a short, depressing life cycle. I have plenty of annuals in my garden now that still look as good as—or better than—when I planted them in May. A geranium, for example, gives a far more enduring performance, with handsome foliage and a pleasant scent thrown in for free. Still, anything en masse can look impressive—I’ll have to make a site visit to our new red carpet, and see if I can get a better shot than the one I’m using here (which I think is a stock photo). Before they’re all soggy and brown. The complete list of events is here. What Does An Organic Gardener Do About Flea Control? I'm sure my vet thinks I'm a terrible cat owner. Whenever I bring Loretta in, they ask me nicely what I'm doing about flea control, and I mutter and shuffle my feet and make excuses. The truth is that I don't know what to do. I don't know why it took me so long to just read the package and find out what was in those drops. Well, what's in them are pesticides, of course. The same pesticides I refuse to spray on my plants. So why would I put them on my cat? Phenothrin. Imidacloprid. Fipronil. The NRDC maintains a directory of flea control products and their ingredients if you'd like to look them up yourself. The UK's Pesticide Action Network has created a useful list of ingredients and toxicity reports--specific to the UK, but worth checking out nonetheless. And the EPA has been evaluating complaints about pet poisonings and coming up with new requirements for these "spot-on" treatments--their whole program is summarized here, and there is a link to a reporting system for reporting problems with these products. And this report (PDF) suggests that fleas may become resistant to these pesticides. Well, yeah. Of course fleas are a problem. They can transmit tapeworms, and ticks can transmit Lyme and other diseases, and they are just unpleasant in so many ways. Combing? Bathing? That's easy enough. Cat flea nematoes in the garden? Maybe not so effective. Electric flea traps? That same report on pesticide resistance I linked to above (PDF) suggests that they might work. Could be worth a try. What are your thoughts? Organic gardeners, what's your stance on flea control? I recently attended the annual conference of America in Bloom, where I got to hang out with such long-distance gardening buddies as Joe Lamp'l and Paul Tukey - more about them coming soon. But a special treat for this local was my first-ever tour of the U.S.Capitol Grounds with Ted Bechtol, superintendent of the grounds and related parks - 274 acres in all. Here he is showing us a newly planted American chestnut, a cross with the disease-resistant Chinese species. Designed by Frederick Law Olmsted in the 1870s, the Capitol Grounds includes 4,200 trees (187 species of them) and 85 beds filled with annuals and tulips. Olmsted's primary here was to complement the building, so trees are sited so as to not block views of it. The photo below illustrates a departure from that original intent - the tall shrubs hiding the foundation of the building on the Senate side. Bechtol plans to remove them, which will make the building look more massive and imposing, as Olmsted intended. Unlike so many other properties in post-9/11 Washington, there's no fence around this one, thankfully, so acccess and openness reign. In addition to the occasional demonstrations, there are performances - by high-school and armed forces bands, as well the National Symphon y Orchestra and the televised July 4th show. Not to mention the Inauguration. As a consequence of all that public access, the lawn here is good enough but can never be perfect. 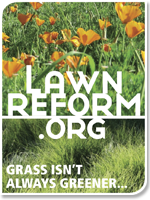 Speaking of lawn, I asked Bechtol how this one is cared for and I was glad to hear that only organic fertilizers are used on the 90 acres of turf under his care, plus top dressings of compost and leafmold. He's reduced the use of weedkillers since he became superintendent four years ago, thanks in part to simply raising the mowing height. Olmsted's design included not just paths and plants but all the infrastructure here, both above- and below-ground, and lots of hardscape features, like the red granite lamp piers, one of which is shown with the Library of Congress in the background. Work accelerated in 1877. By this time, according to Olmsted's report, "altogether 7,837 plants and trees [had] been set out." However, not all had survived: hundreds were stolen or destroyed by vandals, and, as Olmsted explained, "a large number of cattle [had] been caught trespassing." Here's my take-away from the tour: If you're a landscape historian or tree-buff, you'll love the place and appreciate Bechtol's efforts to replicate Olmsted's original collection of trees. But otherwise, the U.S. Capitol isn't a spot I recommend for garden-seekers. If you don't believe me, notice in this slide show about the horticulture of the Capitol that there isn't much there. For visitors of all sorts, gardener or not, there ARE some highlights of the U.S. Capitol that I've come to love in my 30+ years of working there: the Old Supreme Court Chambers and the Brumidi Corridors. And though I haven't visited yet myself, I hear great things about the new Visitor's Center. For the garden-seeker I recommend these gems that are close to the Capitol building: the U.S. Botanic Garden and Bartholdi Park across the street from it. Then venturing into nearby Smithsonian territory, the grounds of the American Indian Museum grounds are terrific and my favorite garden in all of D.C. is the Ripley Garden, tucked into a passageway next to the Smithsonian Castle. Gratuitous extra photo: Bo Obama posing in front of the Washington Monument. Looks like him, right? First, there was the black screen with a “C” prompt. That was the PC I used to learn the Wordstar program in 1984. Two years later, I bought my first Mac. Suddenly I was looking at a screen where graphics and blocks of text could be easily seen and moved around—and soon I was making newsletters, calendars, and fooling around with sound programs. Even in the days before the web, Facebook, or Twitter, I was on my computer every day; it was easy and fun. Eventually, all PCs were employing a graphical interface (more or less), but I am not the only one giving Apple and Steve Jobs the credit. If publishing our images and thoughts on gardening wasn’t easy, none of us would do it. We’d be too busy working, raising a family, gardening, traveling hanging out with friends, or any of the other life-related activities. But it is easy. You point, you click, you upload a picture, you type a few words, and you can see what it looks like right away. Many of the gardeners I know locally struggle with technology. Even here, I remember the initial reluctance about Twitter and Facebook. Now, I think many people who would have spent their time reading and commenting on blogs are switching to the faster, easier communications those networks make possible. It’s a natural progression. But whatever happens, it’s all so much better than that black screen. So—even though I neither know nor care if he was a gardener—I’m thanking Steve J. Why is your garden such a mess? You call yourself a garden writer? Sean next door, who is actually too polite to raise the issue, but has been living with my half of a 10 yard load of wood chips in his parking spot all summer. It hasn't been a pretty year in the garden, though in my defense, last year my vegetable garden was spectacular, just a sea of well-weeded and beautifully organized food. And we did have some good moments here this year, namely the best tulip spring ever, thanks to Elizabeth's suggestion that I try some species tulips. I wound up with the same three colors--purple, yellow, and orange--in an outrageously artful and piquant range of shapes. Oh, and it was all extra-amazing, because it happened at the same time as the wild white violas were blooming like sprinkles on a colorful cake or sequins on a colorful dress. The roses were nice, too, back in June when someone restrained them. What the hell happened since? The media business struggled. My dream job--gardening columnist for a major newspaper--no longer exists, killed off, ironically, by the likes of this blog and many others. Maybe it's possible to make a living as a garden writer after you've written 8 books, but on a single book? Impossible. So newbie garden writers have to keep the day job, unless they marry rich or are born rich. Nope and nope. The economy is horrible. But, after a dry spell, I've had a flood of writing work since May, and it would be insanity to turn it down. Sometimes garden writers have kids with demanding schedules. No funds for help. Of course, help is not really my thing. I love using a shovel and wheelbarrow. Let's get back to no time. Lack of inspiration. I made my vegetable garden in the city this year, and let my beautiful country garden become a mess of weeds. Some people are city people. I am just not. The things that make me happy are the sound of peepers, the motion of dragon flies, fireflies when a hillside is full of them, and meadows pulsing with insect life and goldrenrod in late summer. None of these things can be found in 7500 square feet of theoretically civilized yard. Henry the dog. He's a country character, just like me, and needs to run off the leash every day. So we run. He's undoubtedly prolonging my life, but shortening my gardening time. The other big question on everyone's lips is, why am I not more ashamed? I've been gardening for a long, long time. There are bad years in the garden, and there are spectacular years, just as there are in life. Next year, I am convinced, will be a better year.